1. Fill serving glass with ice to chill and set aside. 2. In an ice filled glass combine whiskey, sweet red vermouth and angostura bitters. Stir to mix. 3. Discard ice from serving glass and drop cherry into base of glass. 4. Strain mix into glass. Enjoy responsibly! 2. Strain mix into ice filled serving glass and garnish with orange and cherry. Enjoy responsibly! 1. Pour hot coffee into glass and add the brown sugar. Stir until completely dissolved. 2. Add whiskey and stir once more. 3. Gently layer whipping cream on top using the back of a spoon. Enjoy responsibly! 1. Add mint, sugar and water into base of glass and muddle gently. 2. Fill the glass with crushed ice and pour over whiskey. Stir well. 3. Garnish with a mint sprig. Enjoy responsibly! 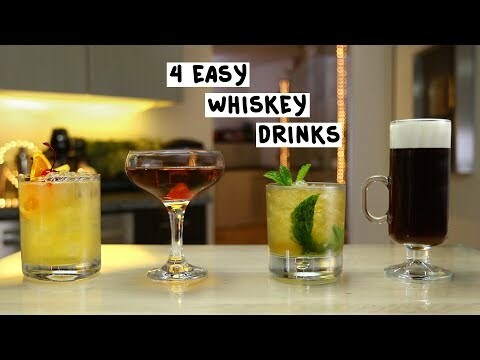 Amaretto Whiskey Drinks : Drink Up!